Television actress Ragini Khanna also comes on the show. She speaks about the best family survey advertisement in the newspaper and the winner will get a flat in Delhi and 5 lakhs cash. She makes him agree on it and tells that she hired a personality development teacher to teach them good interpersonal skills. Both argue a bit on this.. Sooner then, the personality development teacher- Komal (played by Ragini Khanna) comes in to meet Bittu’s family. Bittu flirts with her and acts like an astrologer holding her hands. She stops his flirting and Bittu introduces Komal to his family. Komal asks them to give an introduction but all – Daadi, Raju, Palak’s mother -Pankhudi and even Kapil don’t know what’s an introduction is. Daadi and palak’s mother both fight on this discussion. – How to welcome somebody? Raju and Bittu doesn’t do it well. The role reverses and bittu acts as Komal and they introduce each other by hugging and doing air kissing. She tells Daadi and Palak’s mother to do the same – Introduction with hug and air-kiss. – Next teaching, How to spell their names to somebody with good manners ? Palak’s mother -Pankhudi speaks her name and appends manners at the end. Kapil says that men is called ‘Nar’ and hence he is Kapil with Main nar.. Dolly (Daadi) with woman- nar as she is a women..Komal says that there is a word called pardon to excuse when you don’t understand. They couldn’t understand what pardon means and even pankhudi even compares pardon to fart and then makes a big fart hitting their goat..
– Furthermore, Komal says says only two things make people simple and sober and it is about how to eat food. They again makes joke on how to eat food.. She gives them napkin cloth to keep while eating food. Bittu’s family takes time to understand where to put the napkin and then Daadi-Pankhudi fights with fervor. Komal runs from there after seeing their madness. Thereafter, a person comes there asking for Bittu sharma and gets a slap from Raju as he didn’t mention Shrimati before calling bittu’s name. He introduces himself as a public surveyor who came to assess their family for best family survey prize. Bittu becomes happy on hearing this. They fight in a disguise of lungi dance and tells that family has lot of love. Bittu introduces Raju with great respect making raju surprise. 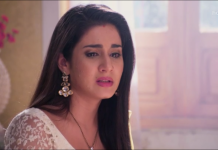 Mrs. Sharma comes in and Bittu cracks a joke on her mouth and then speaks sweet with her for which she responds and requests him to say at least once – komal kalli, gulaab ki pankhudi hote wali.. The surveyor becomes happy and says that he is satisfied and only wants to see them eating food now. They put their napkin and then seems lost. Bittu manages the mess and surveyor is seen to be happy. At that instant, Bua comes in and tells her that she won lottery by gambling and tells all other petty things like Bittu’s stealing neighbor’s dog, Daadi’s alcohol bottle.. Bittu and all the family becomes nervous after hearing Bua’s statements. The surveyor finally understands that the family is not good. They get hold of surveyor and snatches the cash and runs..
Kapil introduces Jeetendra by saying – 200 films as an actor, ever-popular, ever-green, ever-young Jeetendra saab. Jeetendra -commonly referred to as Jumping Jack comes in with a song being played – “Mast Baharon Ka Main Aashiq” from his movie – Farz (1967). Kapil welcomes him. After that, Tusshar Kapoor, his son comes in and dances on the song – Nainon Mein Sapna, Sapno mein Sajna Ta Thaiya ta thaiya ho o.. from the movie Himmatwala (1983, 2013). 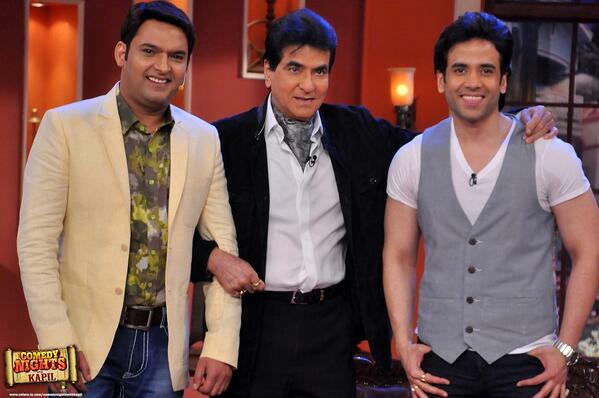 Kapil welcomes both father-son duo on his show. When Kapil asks him, How is he feeling to come on his show ? Jeetendra says that in 1962 he acted in his first film as a hero, and now on Kapil’s show he has the same feeling.. Kapil says that he is happy because his father’s name is also Jeetendra and both of them are from Amritsar.. He tells that Jeetu ji’s first film – Geet Gaya Patharon Ne and he did it 51 years ago. 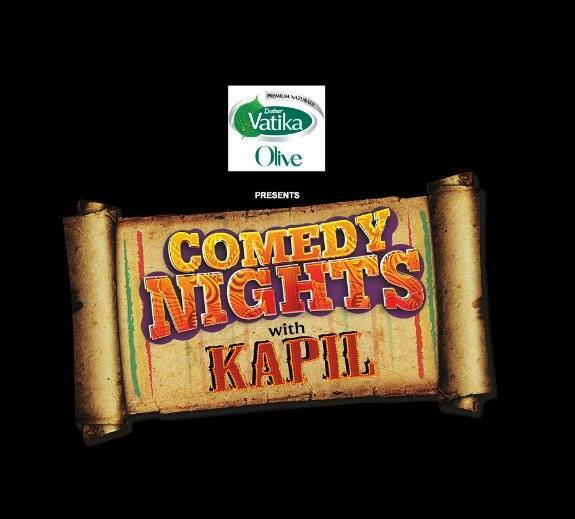 Kapil asks, How does he maintain himself well ? Jeetu ji: He says he tried his best to not maintain and puts very less effort. Kapil: says that Jeetu ji has done more than 200 films, he asks, when he came to movies, whether he was married or single? Jeetu ji: says that he married very late after coming in movies. He was a junior artiste and his wife was his girlfriend then..
Kapil: Asks Tusshar, who was the best female lead with Jeetu ji? Sumona comes in and welcomes both. She asks Jeetu ji, what kind of Bahu he wants ? Jeetu ji: He says somebody like you..
She says that there is some girl in her relatives and she wants to propose that girl for Tusshar.. She speaks good things about the character of the girl. Bittu counter’s with negative things about that girl. Mrs. Sharma then calls Palak who she was referring to and Palak comes in.. She leaves and Palak sits alone with them, and Bittu asks her to sing a song for them.. Palak sings – Yeh duniya..song and she wants Tusshar to speak anything that he wants to ask her. Tusshar asks who stays along with her in a zoo..
Palak responds with her trademark Ooo.. sound. She says that Bittu is a Loser to which he responds her as a 50 litre Geyser. She informs Tusshar about her male friends. Bittu says that she has whale friends..Tusshar also agrees on this.. She begs Jeetu ji and calls him father-in law and promises him that she will take care of his family. Palak also informs that she wants to work in films after marriage.. Palak asks them to not interfere in her decision on films..
She asks Tusshar whether their relationship is concrete? 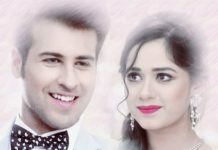 Tusshar says that he needs some more time.. Palak cries and says that her investment is lost as she has already paid a choreographer to learn dance for her sangeet and marriage… She insists for a dance so as to compensate for the loss and then dances with Tusshar on the song -Dil Darling Darling song. Palak thanks them before leaving..
Kapil says that there are old memories which we will revisit..
Pic 1: Sridevi with Jeetendra: In this pic, jeetu ji looks very nervous and also serious. Jeetu ji: Sridevi is the finest actor and she has very less weight and it was not a problem for him to lift her. Jeetu Ji: He tells that he belonged to a low-middle class family and after his first film as a junior artiste, he acted in director Shantaram’s movie – Geet Gaya Patharon Ne. He took the help of Rajesh Khanna – Kaka for the audition and prepared a screen test with him. But on the screen test next day, he got own dialogues from Shantaram who used to speak Kolaveri Urdu. He became frightened after seeing those dialogues as he prepared for a screen test with plays. He tells about his respect for Shantaram Ji and cites good learning experiences with him..
Kapil says that these are sweet memories of the long struggle and congratulates him. Kapil: refers to Jeetu ji’s Nagin (1976) movie. Whether Jeetu ji got fear for becoming a snake in his movies ? Jeetu ji: He says about his relationship with Prem Chopra and how they used to be out of work for 25 days in a month at tha time. Prem ji was afraid of the snake and he shares his experience with Prem Chopra ji during the shooting of a movie Jawab (1970). your father’s time, whom would you date, Sridevi, Reena Roy, Hema malini, Rekha ji ? Tusshar: He says he cannot be able to choose one from this group.. Audience: Dances a bit with Jeetu ji on the song – Mast Baharo ka Aashiq ..
up line that he had heard ? Jeetu ji: while acting in his movie near a beach, a girl passed by and he threw a channa (gram pulses) towards her and it hit her. The same girl is his wife – Shobha ji..
Kapil: Tells about Jeetu ji’s friendship with Prem chopra, rakesh roshan ? Jeetu ji: Shares an experience of 1978 when he went to Sharjah to attend a function along with Prem Chopra and Rishi Kapoor. They got a gold plated watch as a gift at the function. At the customs, Rishi kapoor was stuck and they passed successfully. To their surprise, Rishi kapoor even also told the customs about their watches and this led them all to pay the customs duty. He shared this experience to shed some light on his friendship. Dadi comes on a Gori tere Ang Ang mein song and dances. She asks him how is he ?.. She acts shy and then speaks that does he know that they met 30 yrs ago ?..Daadi says that actual meeting happened during the filming of the movie Tohfa (1984) and the Ang Ang Mein song was supposed to be picturised with Jeetu ji and her, but due to her drinking she couldn’t do and she found herself in the lap of Shakti Kapoor. She says that she has a good story and wants to enact a scene with him.. She insists him to participate in the scene..
She tells him to say – I love Dolly..And in the scene, she assigns Tusshar as Jeetu’s ji father and Kapil as his mother..They enact the scene with good laugh. After this, Tusshar gives her a rose and then Tohfa Tohfa.. song is played with both Tusshar and Daadi dancing together..She also gives Tusshar shagun ki Pappi and gives the kiss on Jeetu ji’s hands. Jeetu ji before leaving says that he got lot of fun and the audience was very lovely and he never expected that he will get so much fun. Kapil thanks them for coming and the show ends on a happy note. Next week guest: The original disco dancer- Mithun Da and Subhash Ghai. Mithun and Sumona are seen speaking in Bengali and seems to have a hilarious time on CNWK.